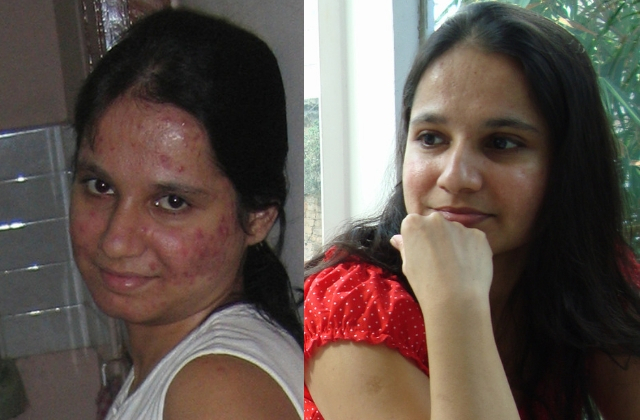 I’m Anjali, the creator of this little blog for women who are struggling with acne. If you have exhausted every acne treatment and dermatologist out there and are looking for natural ways to cure your acne, you’re in the right place! I struggled with acne for 20 years. As only someone with acne will understand, I shed a lot of tears over the pathetic state of my skin. Once I cured my acne naturally I knew I had to share my story with other women like me. Look at the picture below. They are taken 2 months apart. I have no makeup in either. The pic on the left is how I had looked for 5-6 years. All the time I had tried antibiotics, benzoyl peroxide and countless other treatments. The pic on the right is after ditching all acne treatments and just making one diet change. I don’t want anyone to have to suffer for even a day with acne, forget years. That is why my blog was born. I have been featured in MindBodyGreen, Elephant Journal, Huffington Post and LifeHacker. I’m from India but I now live in Australia with my hubby and my son. I’m a foodie and a yoga enthusiast. I’m absolutely terrified of butterflies. Seriously…. I jump around in terror when they fly near me. The more colourful they are, the more scared I am! I share whatever worked for me on my blog. As I discover more, that goes up on the blog as well. I try and reply and help anyone who emails me. There are some things I share only with my email subscribers, so go ahead and enter your email below.